Sea-Spray consists of 6 quality self catering units located in the Margate area that can sleep from 2 to 10 people, with group bookings of approximately 20 people. (Discounted rates apply for group bookings). All the units are self catering and are very comfortable and fully equipped, including free Wi-Fi, a DSTV connection (Just bring your own decoder), private braai facilities, swimming pool, and adequate security. Pets are also allowed although prior approval is required. We also have water tanks on the complex to provide uninterrupted water in the event of supply interruption from the municipality. With Margate being the holiday center of the South Coast, Sea Spray is perfectly positioned so that you can take advantage of the various activities up and down the Hibiscus Coast. Unit 01 in Sea Spray is a large double-story thatched unit which can sleep up to 10 people. The unit consists of 3 bedrooms and 2 bathrooms and is located next to our swimming pool and entertainment area. There is also a paved patio specifically allocated to this unit. Unit 03 in Sea Spray is a comfortable 3 bedroom unit that can sleep up to 5 people. The unit consists of 3 bedrooms and 2 bathrooms. The main bedroom has a double bed is en-suite with a bath and shower. There is a double bed in the second room and a single bed in the 3rd room. 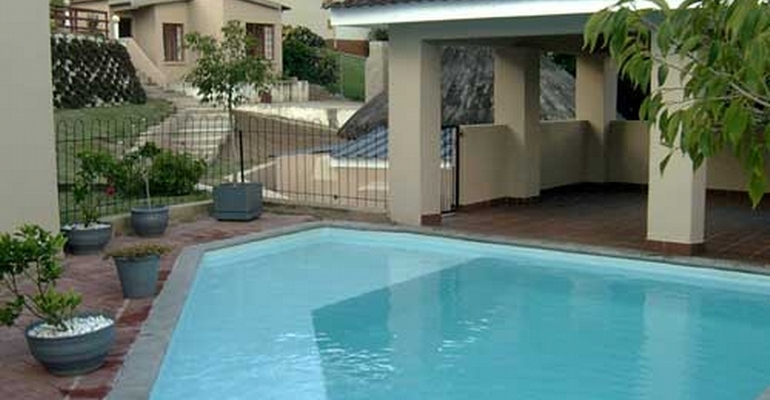 There is also a cemented patio with a built-in braai specifically allocated to this unit. Unit 05 in Sea Spray is a 2 bedroom unit and sleeps 4 people. The unit consists of 2 joined bedrooms with a double bed and a single bed. There is also a single bed in the dining area. There is one bathroom with a bath and shower. There is also a paved patio in front of the unit with a sea view and built-in braai. Unit 06 in Sea Spray isa one bedroom unit that sleeps 2 adults. The unit consists of 1 bedroom and 1 bathroom and a small kitchen. There is also a small patio with a built-in braai. Our rates vary depending on the unit and number of people. We also have close connections with a nearby business offering team building and conference facilities. Please note that we do not provide towels, toiletries or cleaning materials. To find out more about what we have to offer please contact us. Come and enjoy the Hibiscus Coast!